The Fragrant-orchids have been the subject of much molecular study in recent years, and as a result of differences revealed between them, the three British-growing varieties currently recognised as varieties of Gymnadenia conopsea and frequently called Gymnadenia conopsea (Chalk Fragrant-0rchid), Gymnadenia borealis (Heath Fragrant-orchid) and Gymnadenia densiflora (Marsh Fragrant-orchid) may eventually be accepted as three distinct species. The third of these types, Marsh Fragrant-orchid, grows in alkaline marshy ground and is therefore more easily distinguishable by habitat if not by obvious morphological differences. The remaining types, Chalk Fragrant-orchid and Heath Fragrant-orchid are more difficult to tell apart. 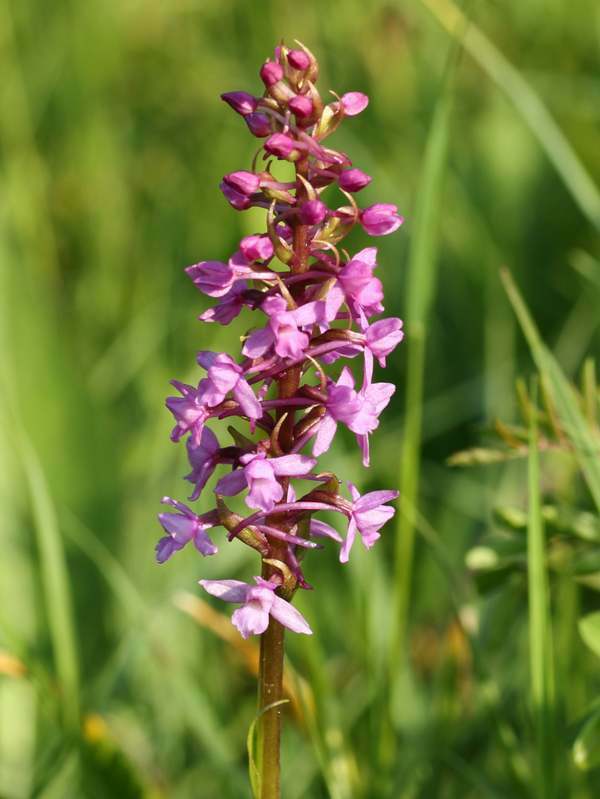 The Heath Fragrant-orchid only grows to a maximum of 30cm making it the shortest of the three varieties of fragrant orchids to appear in Britain. It has 3-5 narrow leaves at the base of the stem which are deeply folded and pointed. 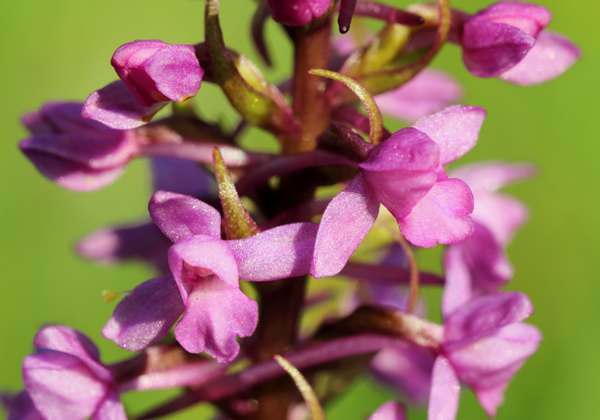 The small, lax inflorescence which carries up to 30 dark pink flowers also sets it apart from Marsh Fragrant Orchid and Common Fragrant-orchid which have much more robust flower spikes carrying many more flowers. The three fragrant orchids that grow in Britain are so frequently confused with each other that it is very difficult to determine their range with any confidence. However, Heath Fragrant-orchid is recorded from many parts of England and Wales, from Cornwall in the south to the Scottish islands in the north. In other parts of the world the picture is even more confused because there is an additional plant called Gymnadenia odoratissima which is accorded species status to add to the equation. Heath Fragrant-orchid is recorded in France. Gymnadenia conopsea var.borealis grows in unimproved grasslands, sand dune systems and grassy moorland. It is tolerant of some degree of acidity.. This orchid flowers from late June to August.